I am a perfectionist. I expect everything to be done just right (especially when I am doing it myself). I put way too much stress on myself because I won’t let anyone help me, then it all builds up and I crack. This is something I’m trying to work on and admitting it should be my first step, right? All this talk is currently in relation to Noah’s upcoming FIRST birthday party. Of course everything has to be planned out weeks, if not months, ahead of time. Everything has to be homemade and I usually won’t accept any help that is offered (I’m stubborn too). My mantra is to “let people help and let things go” this time around. I’ll let you know how that goes. Well, with the festivities only weeks away my brain is on overload which quickly causes my stress level and blood pressure to rise. But when I saw these beautiful berries at Herzog’s Country Fresh I knew that they would help melt the stress away, if only for a few minutes. And what could be better than stuffing them with a cheesecake-like filling? Dipping them in chocolate too? Is that what you said? I thought of that but decided to use a little restraint but oh that would be good! The original filling recipe tasted too much like plain ole’ cream cheese to me so I added quite a bit more powdered sugar to sweeten them up. It turned out a little runny but was really yummy (like pumpkin roll filling if you have ever had it). My strawberries were pretty small so I used a 1/4 teaspoon to scoop out the middles. Then I piped in the sweet cream cheese. Cut a bit of the bottom off of the strawberry before hand if you want them to stand up. 1. Clean and dry strawberries. 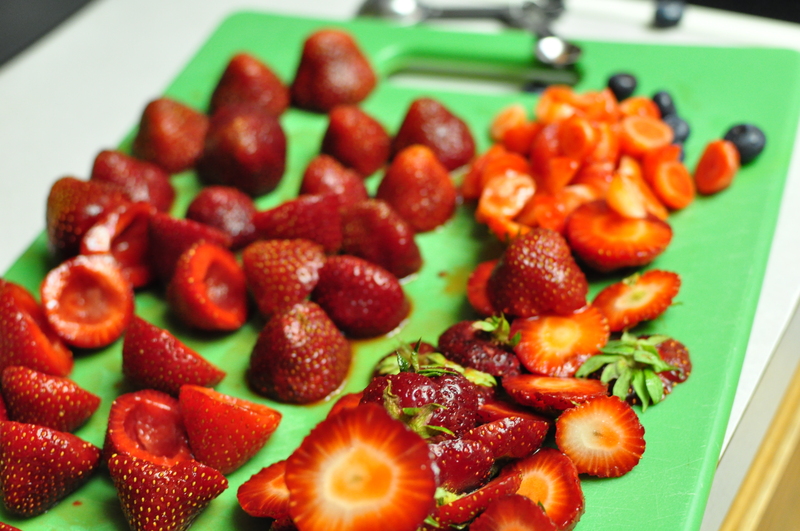 Slice off top and a bit of the bottom of the berries then scoop out the tops. 2. Place cream cheese, powdered sugar and vanilla in a food processor. Place the filling in a piping bag and pipe into the strawberries. Top with blueberries or other topping options. Linked on Cupcake Apothecary and Everyday Sisters Sharing Sunday! What did you use for the flag in the background? Is it a tray? Yep, it’s a serving platter. That’s exciting! Thanks for letting me know! I’ll be checking back often for your themes! Absolutely darling & brilliant idea! I’m sooo glad you shared! I found you at Sharing Sundays. Congrats again! You were featured in A Themed Baker’s Sunday Best of 2011!! There is a button you can pick up at my blog for being featured. Please come back this Sunday where the theme will be Citrus’s! Looking forward to seeing you!